Karsten Kaie´s hit, ironic, one-man show brings Berlin alive like never before. How to Become a Berliner in One Hour? Is that even possible you may well ask? Well… in his fast-paced, dynamic, up-to-date piece Kaie satirises and displaces what it means to be a Berliner… or what it means to be an Englishman… or an American. Whether you´re an expat, a tourist or a native, this show has something for you. 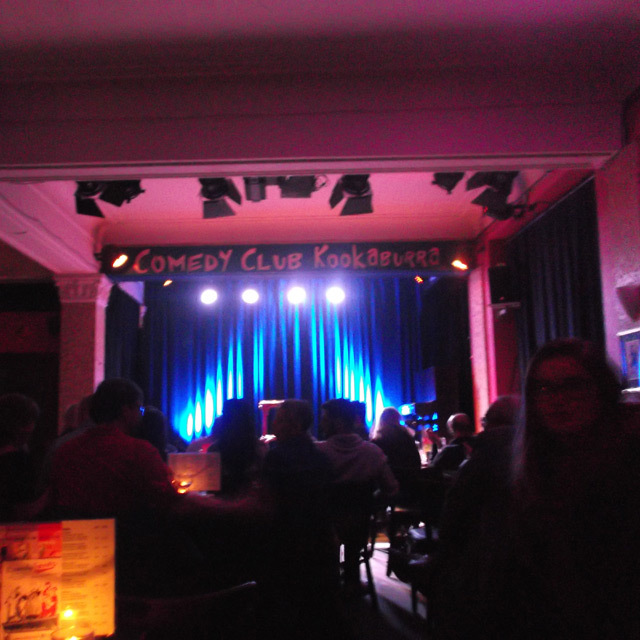 I saw the piece (directed by Olivier Giraud and starring Karsten Kaie) performed on Tuesday 19th May in Kookaburra Comedy Club; a small intimate building that is slightly reminiscent of an old-man´s conservative club. However, as soon as Kaie entered the stage the dynamics shifted; the ordinary looking and modest guy brought punters from all over the globe to life. Kaie took us through different chapters of cultural life in berlin, explaining what to do and, most importantly, what not to do if you want to look like a real Berliner. His profound ability to perfect the local, the expat and the tourist stereotypes, with every classic cliché, and every ear-piercing accent, left the audience tremoring with laughter. The expertise with which Kaie employed caricatured impressions forced the audience to crack up, as they recognised how they themselves fitted one or a number of these stereotypes. Too many parts of Berlin life were explored to mention them all, but in particular his physical masterwork bringing to life how not to behave in a Berlin club invoked cringe worthy, stomach wobbling laughs throughout the room. Despite being very easy to watch, occasionally the scenes shifted rather quickly making it at times hard for the audience to follow. However, as the piece continued Kaie began to transfer jokes to the new scenes, cleverly interlinking the otherwise sporadic episodes. At one or two times the stereotypes were so far on the edge, I felt a little uneasy that they were straying into the offensive (but this may be down to my stereotypically English anxious temperament). How to Become a Berliner in One Hour is cheerful, satirical and easy going due to the witty scripting and Kaie’s total submersion into performance. His tongue-in-cheek attitude undoubtedly highlights the ridiculousness of this allusion of a ´Berliner´ and thanks to his ridiculing of every single stereotype in Berlin you will be made to feel as if you belong here.